Hiiiii!! 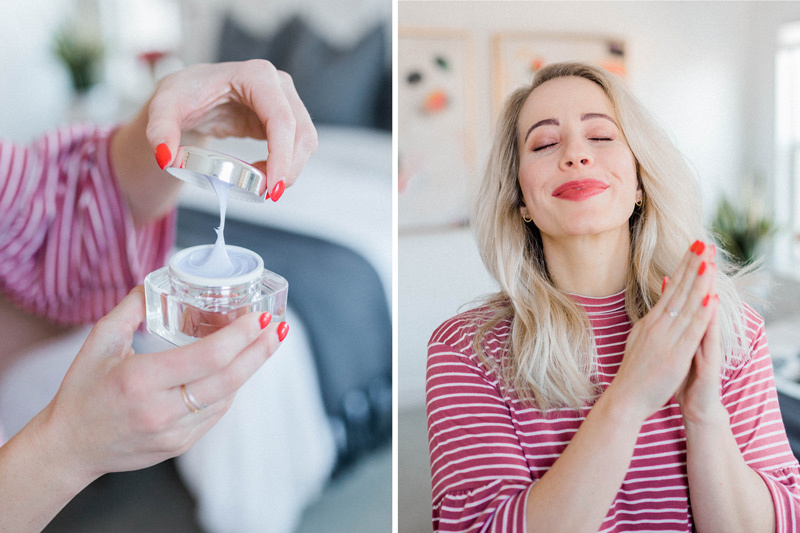 I’m so excited for this post — it has been HIGHLY requested! 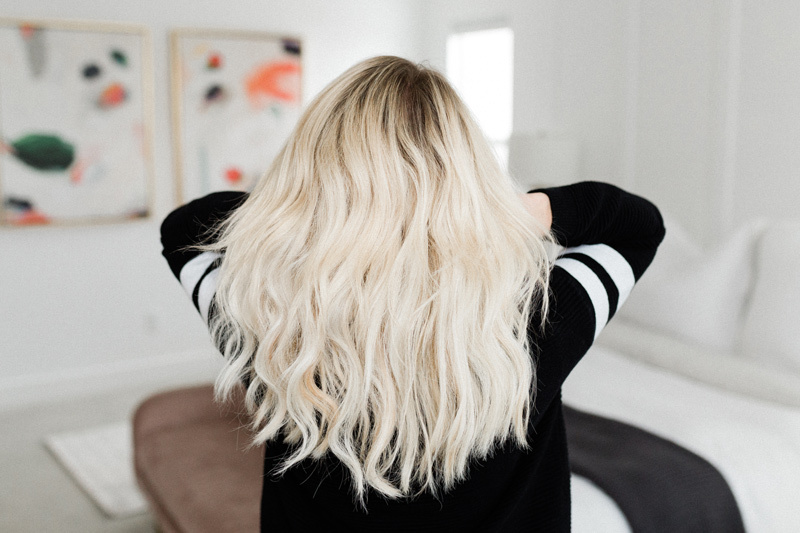 Today we are chatting second day hair and how to revive curls without heat. 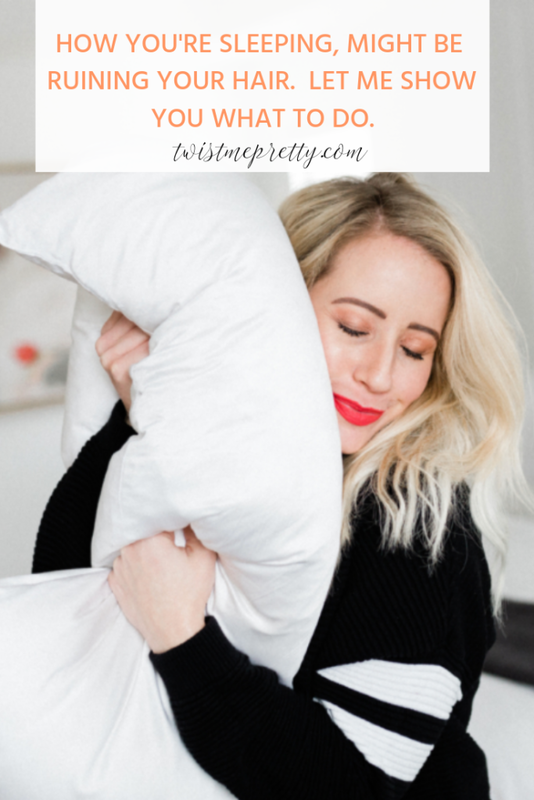 That means I’m sharing my experience with sleeping on my curls + products and general styling tips to get the most out of the curl and texture. 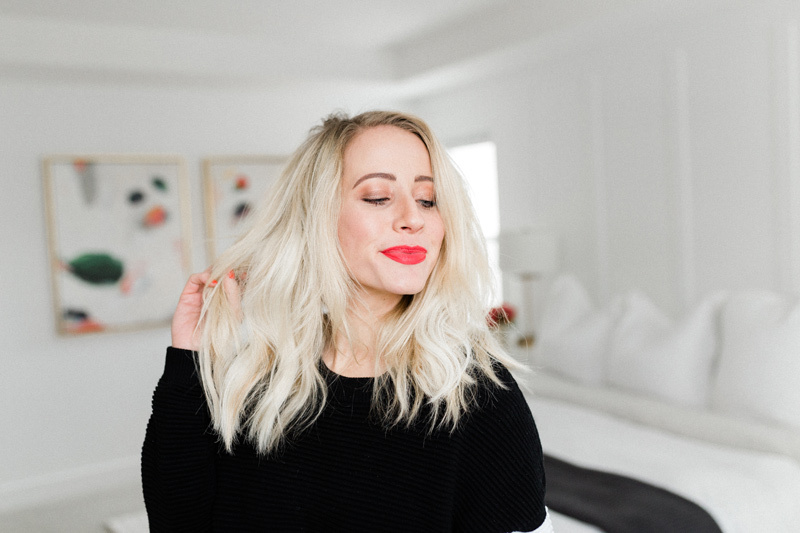 If you missed my haircare routine and how I curl my hair, make sure to checkout this post here. First of all, a curling wand will hold in your curls longer than a curling iron. As you clamp the section of hair in your curling iron, it presses out the volume in your hair and for some reason I’ve never been able to hold a curl with a curling iron. Wand curls are a game changer! Be selective when deciding which wand to invest in because they are not all made equal. 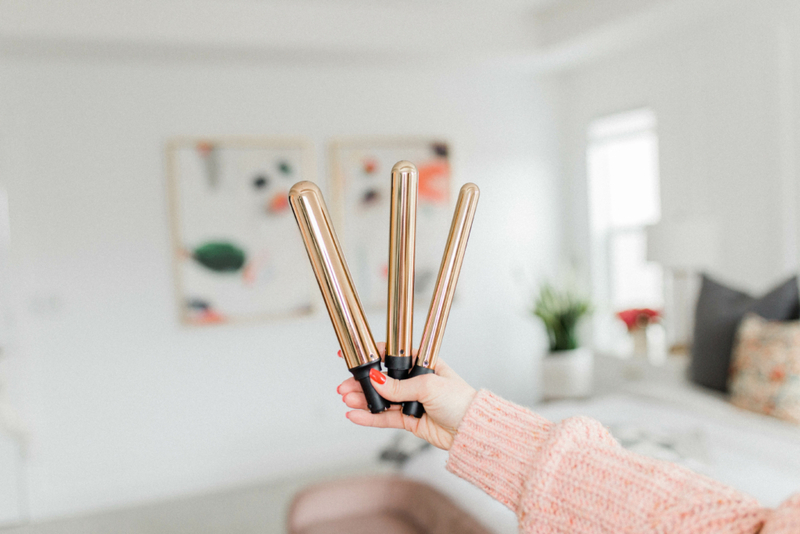 I use the Flourish Trio and believe it’s hands down the best wand on the market right now. Invest in tools that work! 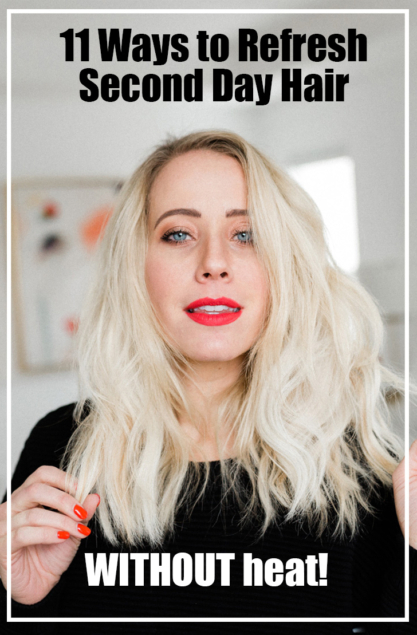 You can check out this post here if you’re looking for better curls that last longer. If your curls are falling out of your curling wand chances are you need to use a smaller barrel. I talk a lot about the 25mm barrel but truth is the 19mm doesn’t get enough attention from me — it’s AMAZING! I’ll be sharing a tutorial on how to get the prettiest beach waves with it but do not discount the smaller barrels. The more coils you can get in one strand the better chance the curl has of surviving! 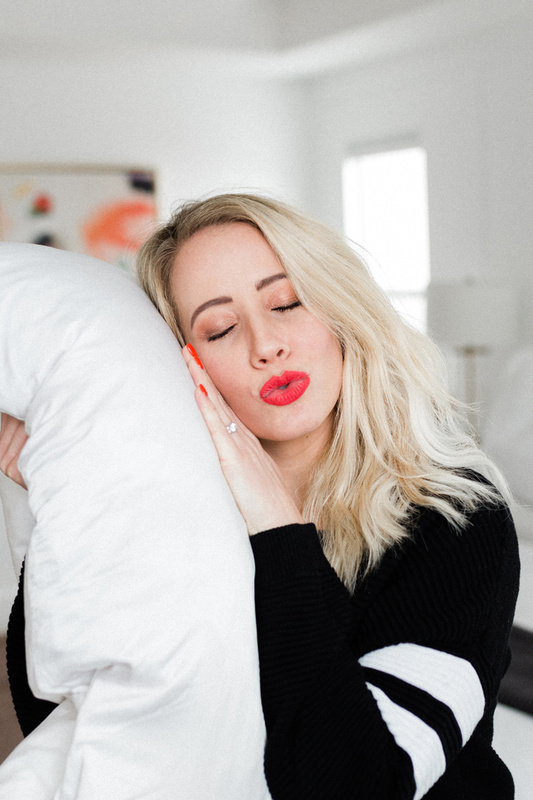 I’ve been sleeping on a silk pillowcase for years and it’s a game changer. First of all, it helps with wrinkles so duh, it’s a no brainer. 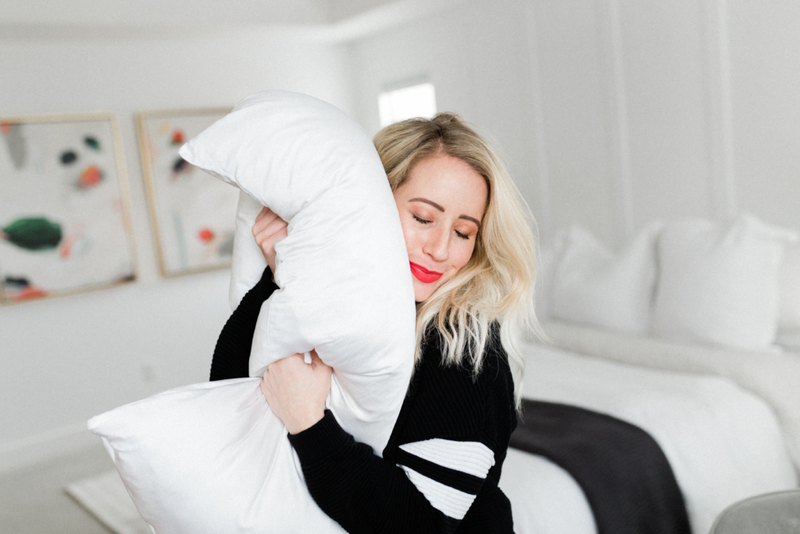 But second, it reduces friction on your hair while you sleep and the protein from the threads in the silk (made from a silkworm) will help retain moisture. I have the coolest product coming out for Flourish that you’re going to die over but we’re still in the development phase and it won’t be ready for awhile. 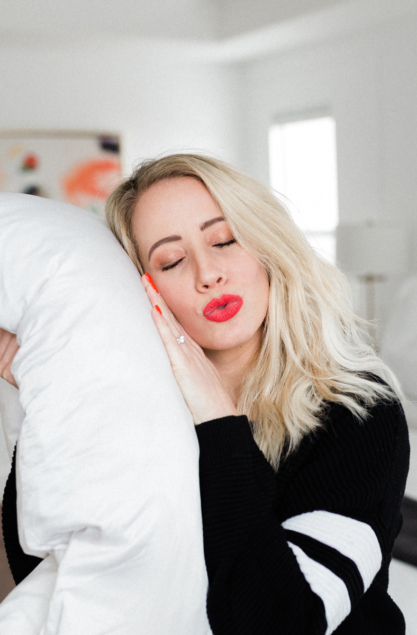 In the meantime, snag a silk pillow case and kiss those straight, frizzy mornings goodbye! 4. How are you sleeping? I forced myself to sleep on my back years ago and so I just drape my hair over my pillow and let the curls cascade gently off the pillow. 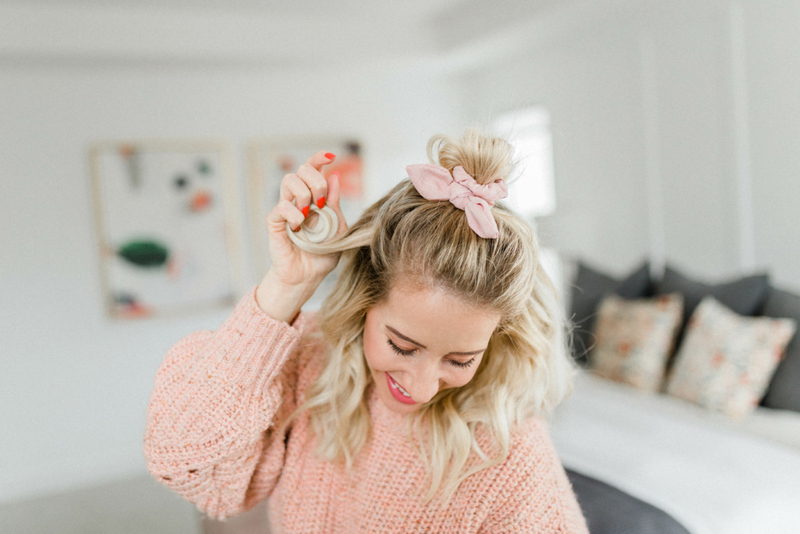 If you have super long hair though you can roll the hair in the direction of your curls (I always curl away from my face) and then roll it in a ballerina bun on the top of my head. 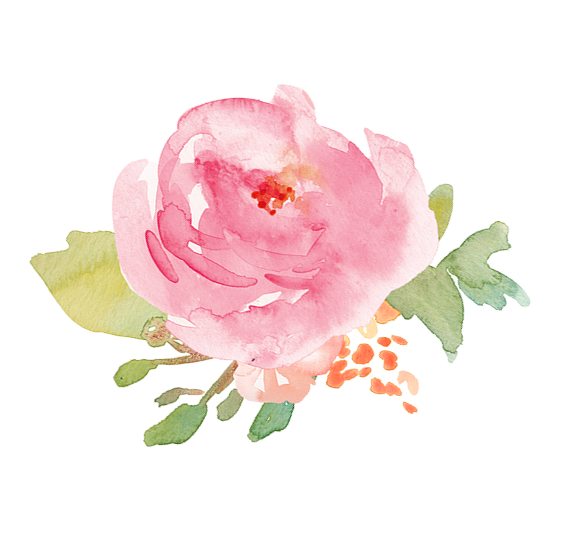 I usually secure with a silk scrunchie… another new Flourish product coming out soon! I’m all about healthy hair and just trying to give the people the best tools to combat breakage from elastic bands and too much heat! 1. 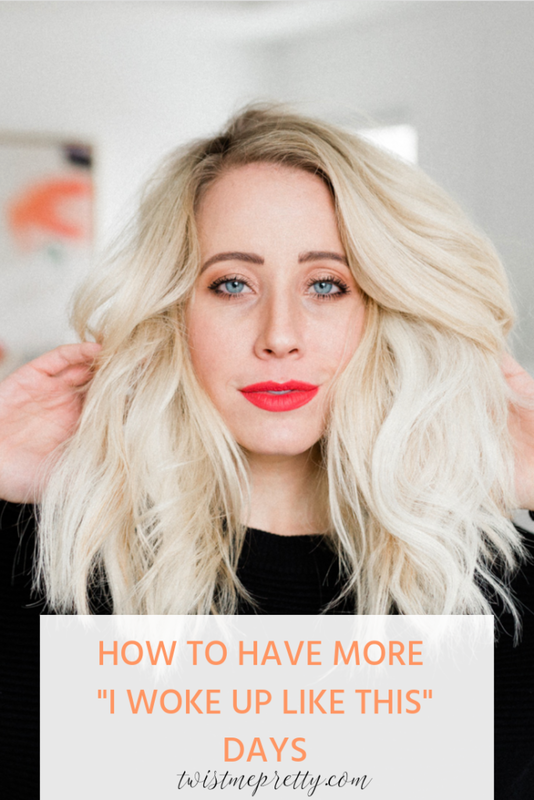 You have fine hair and need more texture! Fine hair doesn’t hold onto texture very well. 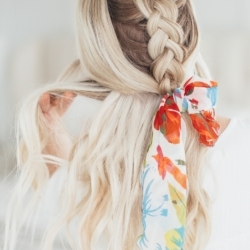 You’ve probably noticed your braids and curls are always slipping out. I’d recommend using a texture spray right after you’ve curled your hair so that the extra texture can help hang onto the curl! 2. Make sure you’re using a smaller barrel on your curling wand. Depending on your hair length, even the 25 mm might be too big! You want as many coils as you can get in your hair. 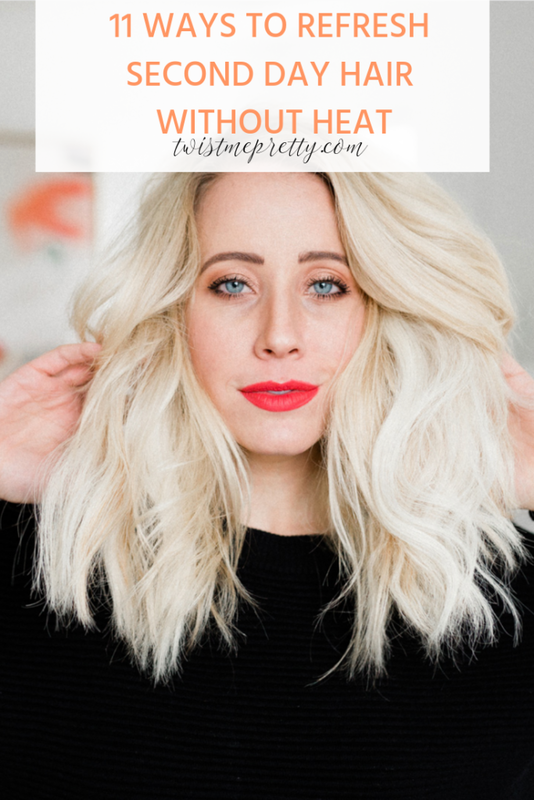 This doesn’t mean that you need Shirley Temple ringlets, you can always brush through and loosen the curls after you’re finished curling but those curls in the hair will hold longer if there is more of them. Does that make sense? 3. 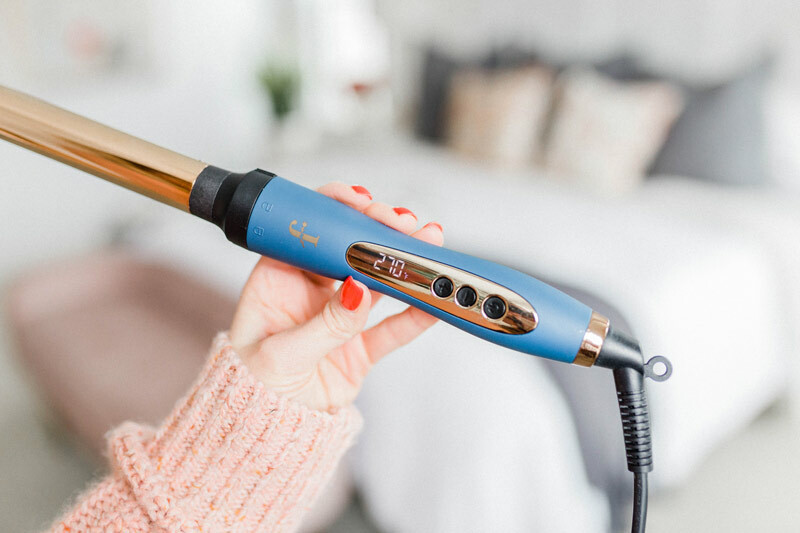 Make sure your curling wand is made of titanium. Not only will titanium help smooth out the frizz but it’ll help retain your curl! I feel like I talk about the Flourish Trio a whole bunch but it is literally the best. It has three barrels so you can switch up your look any time you want + it has adjustable heat settings which is a must and it is made out of titanium. Titanium has even heat distribution so there aren’t hot spots which makes your curls consistent, it helps reduce frizz and it also helps retain curls! It’s amazing and you shouldn’t be using anything else, even if you have fine hair! 4. Make sure you’re setting your curls. This paragraph is super wordy so make sure to watch this video here if you’re confused. Setting your curls means your letting them cool coiled up. So you’re going to wrap the curl around a curling iron and when you’re ready to release the curl go ahead and drop it in your palm so it’s still coiled up in that curl shape and then just press it to your head. You can wait until it’s cool or you can snag a duck bill clip and clip it to your head so it has awhile to set there while you’re curling the rest of your head. The longer you can keep that coil in the hair, the longer your curl is going to last! 5. Turn up the heat – does your wand have adjustable heat settings? I don’t often tell people to turn up the heat — keeping your iron around 350 degrees works for most hair types — but sometimes certain textures just need the heat! In that case make sure you’re using a cream before you blow dry, an oil after it’s dry and then a heat spray. TAKE NO CHANCES WOMAN! 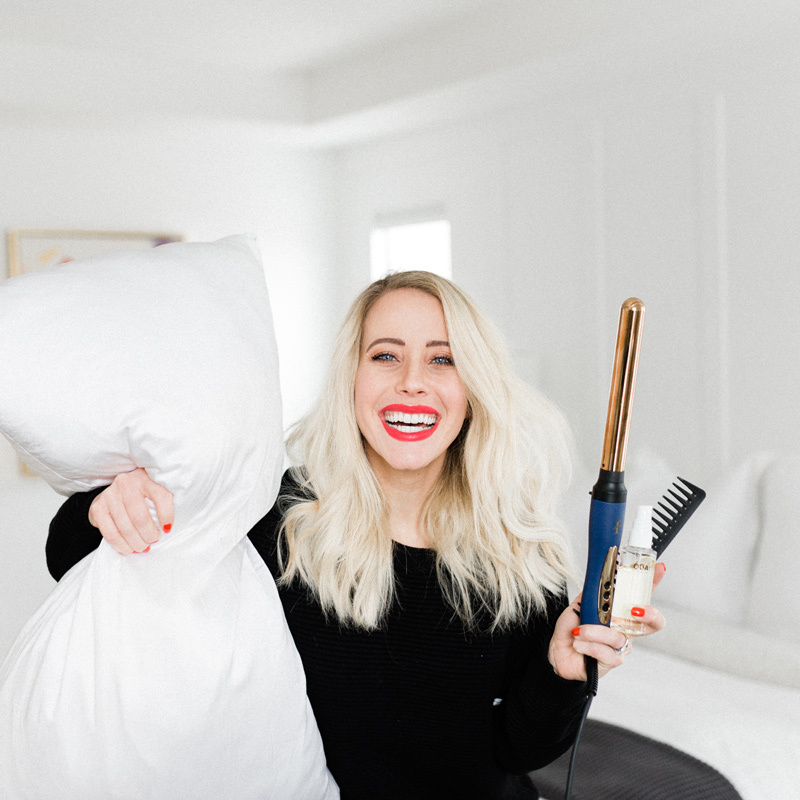 Leaving your hair on a cooler iron for a longer period of time is best for your hair, but turning it up to 400+ isn’t going to ruin your tresses if you’re being smart and not putting heat on your hair everyday. Do you have any other questions? Anything I missed or something else I can help you with? Please let me know in the comments below, I love constructive feedback and helping you guys be successful! 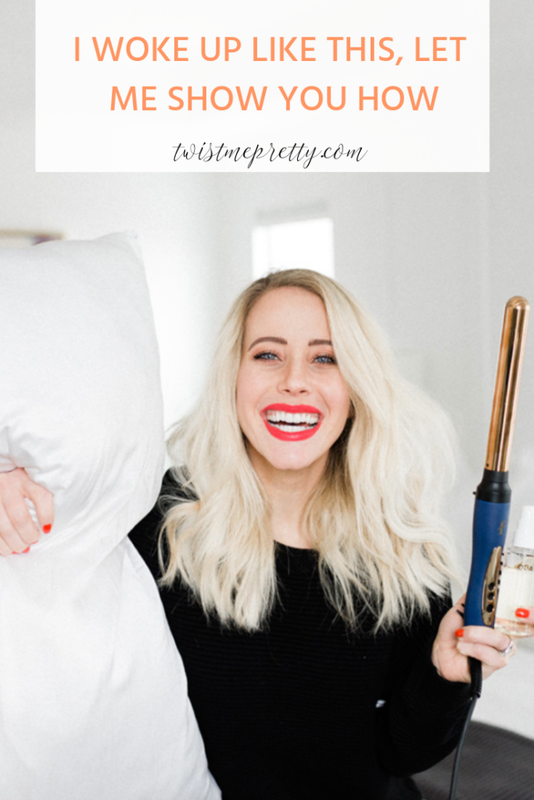 I only do this routine the day after I wash it, save the dry shampoo!!! I don’t usually use dry shampoo until day three or four because I don’t produce much oil. By day three I start incorporating braids into my hairstyles and it’s less about the curls and volume and more about the braids. 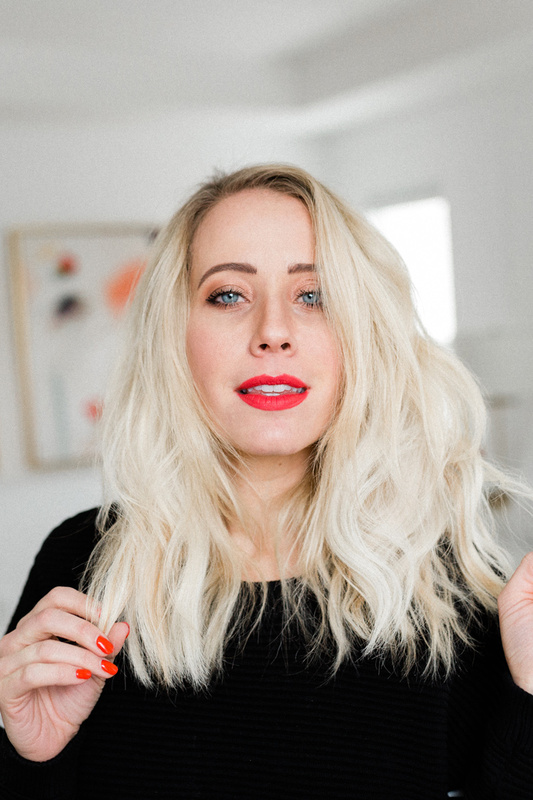 I chatted about the hairstyles I do at the very end of this video but didn’t make it clear I don’t do this every day — usually just the day after I’ve washed and curled! Also I pick and choose what products I need, the ones I’m sharing below are the ones I typically reach for and love but my needs change day by day! Day four is usually when I add in the dry shampoo!! 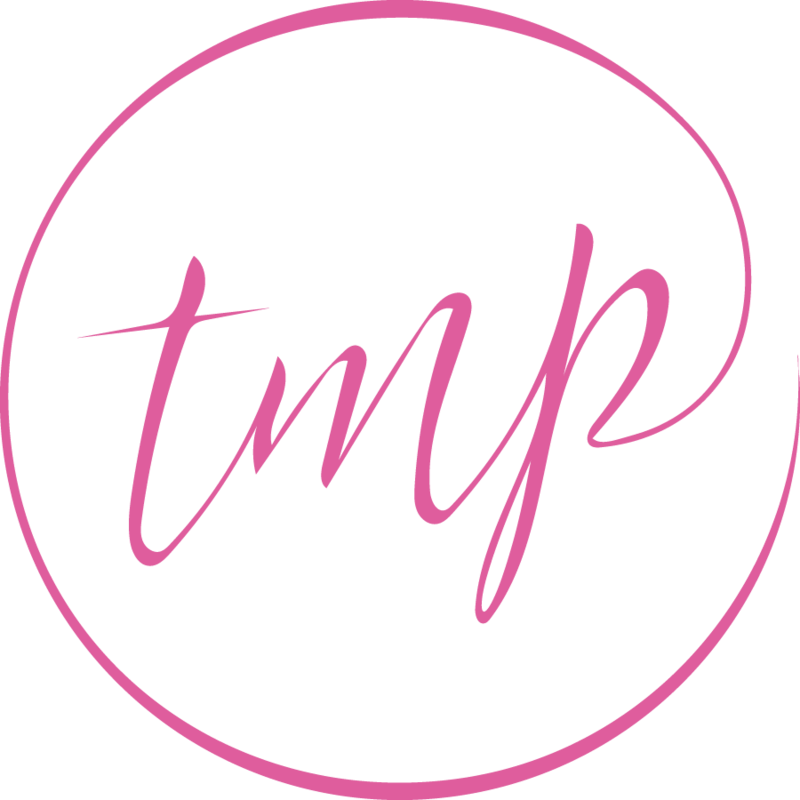 Hopefully this post gives you some suggestions on products you might like and then you can identify what works for you and what your hair needs are! My friend Kayti recently launched a shower cap that I love but it’s sold out, wahhh! I have some fun things coming out for Flourish soon but if you need a good shower cap check Amazon. Shower caps are great because they prevent water/steam from getting on your hair and wrecking your curls. If you don’t have a shower cap just loosely clip your hair out of the way or I sometimes just leave my hair down and stay half way out of the water! Avoid touching your hair at all cost when it’s steamy. I see so many people brushing their hair out the next morning with a paddle brush! No no! A paddle brush works great right after you curl your hair but the next day we’re trying to preserve the curls so you need to use a wide tooth comb or something that’s not going to pull out your curls. Then of course you need some dry shampoo. Let me say, all dry shampoos are not created equal. 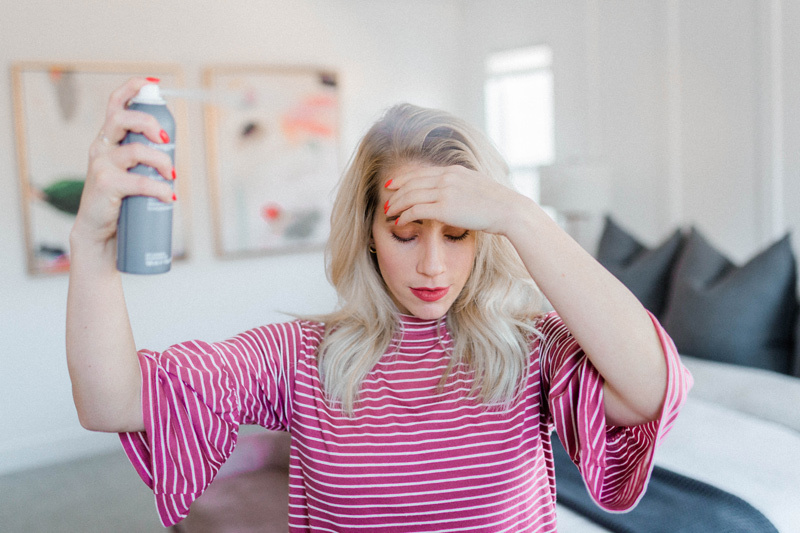 I have converted thousands of people to the Living Proof dry shampoo (I really need to come out with my own 😏) because the truth is that it is far superior to all other dry shampoos currently out on the market. 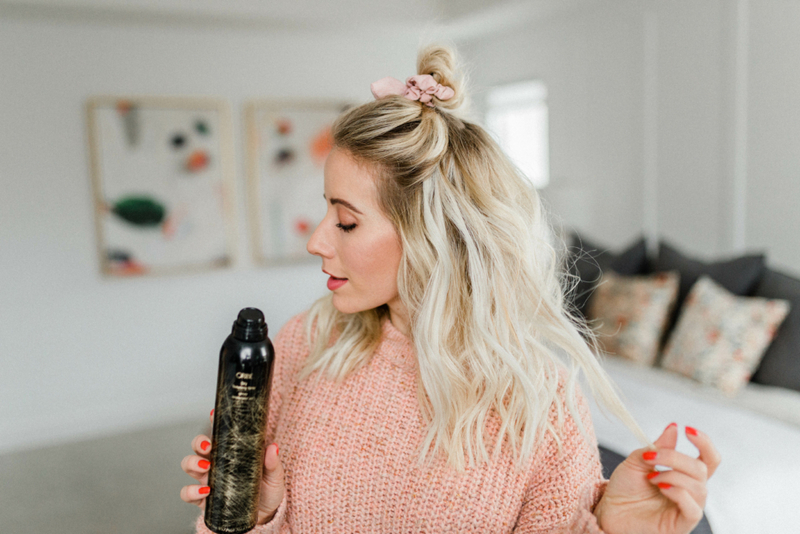 Most dry shampoos leave a film or weigh the hair down and make it feel dirty… which duh, I don’t want to have to wash my hair that’s why I’m using a dry shampoo! Living Proof’s Dry Shampoo truly cleans and refreshes the hair without adding any texture or unwanted grit. I must tell you, I have really dry hair. Oils make a lot of sense for me because I need that extra hydration. If you don’t, skip this step. I like to use an oil though to not only add hydration and shine to my hair but also because they help combat frizz. When I put the oil throughout my hair I like to roll my hands (with the oil evenly distributed on them) in the same direction as the curl. 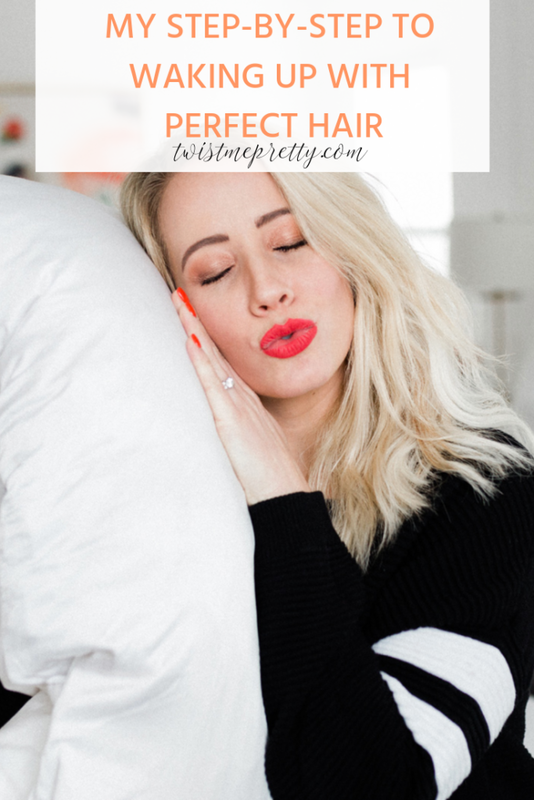 This really does perk up the curl and gives life back to those strands! Lately I have been loving this and this oil! 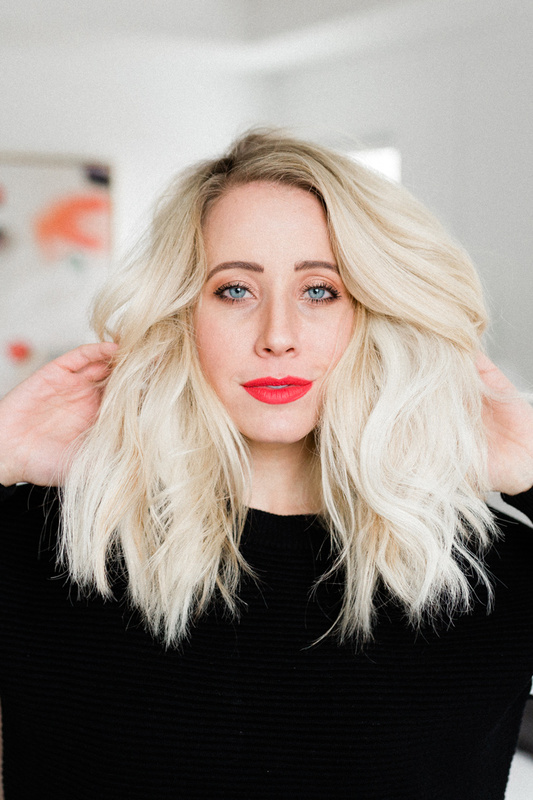 Before you’re finished you should tease your roots just a bit to add some volume and lift back into your hair. Go ahead and tease, I like to spray with hairspray and then use the hairspray can to help set that round shape near the roots. If you have shorter hair, go ahead and use some pomade in the ends to help with frizz and to give it some defined definition. I save this step for last because I like to refine my hair with the pomade and then mess it up with the texture spray. Dry texture spray is going to add volume back into the hair and you can even mess up your hair with your fingers to give it that effortless look. I’m all about volume right now though and texture spray is a must! I prefer the Oribe Dry Texture Spray because it adds texture without making it dirty or heavy. A lot of dry texture sprays add weight to the hair which in turn makes the hair flat. You want a spray that will keep your hair light and airy but give it just enough texture to keep that curl in! Don’t forget to watch the video tutorial + subscribe to my YouTube channel! I’ll use these curls for a couple days and by day three or four I’m braiding the bangs back or doing a quick crown braid. By day five and six I doing side braids or cute ponytails and then I’m wearing hats until I need to wash my hair again! 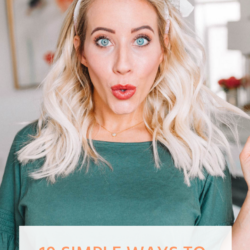 My hair doesn’t hold curl well but there are so many ways you can refresh second day hair without heat and then keep riding that texture through all the cute hairstyles you’ve been wanting to try. 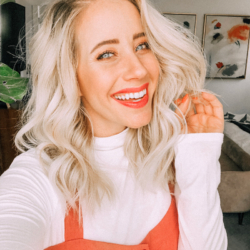 If you need some inspo on cute hairstyles, check out my braiding gallery here and you’ll never want to wash your hair again haha!!! Let me know if any of these tips help you. If you are still struggling, what you’re struggling with and how I can trouble shoot some difference scenarios for you! Do you use the Flourish Trio? Has it helped hold your curls in longer? 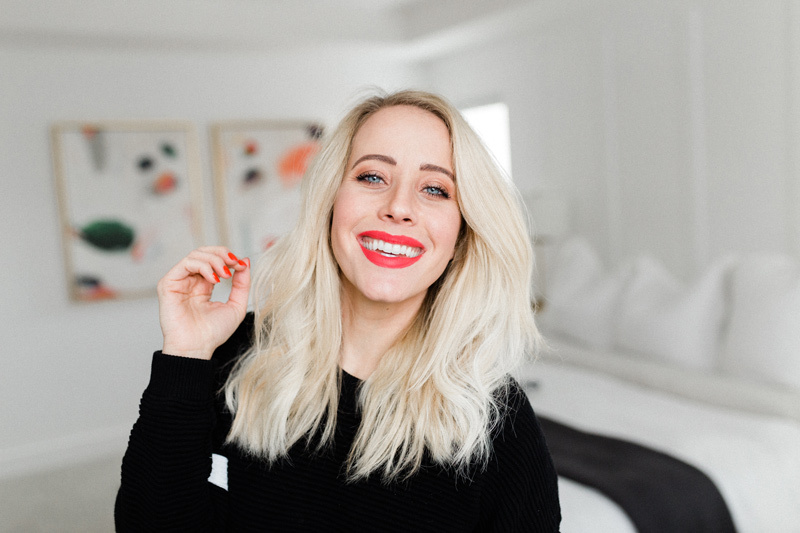 I love you babes, thanks for your support and I can’t wait to hear what you think about this post!